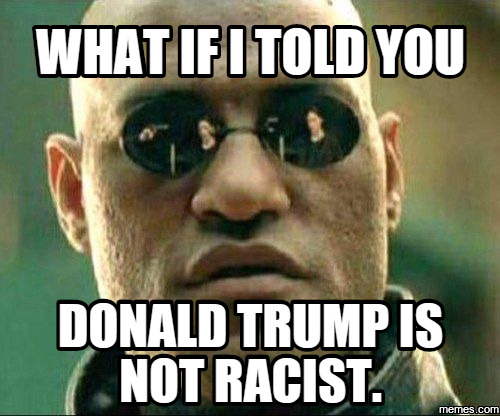 Contrary to popular belief, Donald Trump is not a racist. According to Google, the definition of racist is "a person who believes that a particular race is superior to another." Trump's charge that Judge Curiel cannot fairly adjudicate the Trump University lawsuit is based on his belief that Curiel's Mexican heritage creates a natural bias against a presidential candidate that wants to build a wall between the judge's born nation and nation of his family ancestry. While the merits of this charge are certainly debatable (they seem to have earned precious little merit in the court of public opinion), there has been no statement from Trump that indicates that he actually feels superior to Judge Curiel based on the judge's Hispanic descent. Rather, its just another example of Trump demonstrating that he is an unapologetic nationalist. In fact, counter to the racism charge, Trump is actually telegraphing to the nation, through psychological projection, that he would most likely behave the same way as the judge given the same situation. This is not racism. This is Trump reminding us that his entire life has been defined by winning, at any cost. Yes, many of Trumps's statements seem racist, but it's just a plain fact that they're not. Why does linguistic accuracy matter? Because there's an actual danger for those who inaccurately impugn someone's character: it can backfire and damage the accuser's credibility. Also, it misdiagnoses the problem many have with Donald Trump as a political candidate. If we misdiagnose our candidates, then we'll be voting for or against them for the wrong reasons. Imagine if -- after all of the damage he has done to his candidacy by saying what he said about Judge Curiel, Mexican immigrants, and foreign Muslims -- Trump parsed this out himself and turned it all around on his accusers? He would be able to use the rhetorical overreach of racism to re-enforce the point that the political class and the media elite simply can't be trusted, because they just can't help themselves from exaggerating to make a point, and ultimately get the analysis wrong as a result. That would be a spectacular irony.